"The old adage says you can never have too much RAM. I heartily agree with this sentiment which is why, when I bought my MacBook, I opted to spend the extra dosh for a full gigabyte. Granted, I was moving up from an iBook with about 256 MB, so that was a nice little jump there. But I figured the two 2.0 GHz processor cores would be doing their fair share of heavy lifting." Charles Moore says: I've long maintained that 512 MB is the bare minimum RAM for halfways tolerable performance with OS X, and a few days last week working on my daughter's 1.2 GHz G4 iBook with the standard 256 MB of RAM reinforced that conviction (she has since upgraded to 1.25 GB of RAM). My 17" PowerBook has 1.5 GB, and some days I don't think even that's enough. Link: Is 512 MB Enough? "Macintosh computers used to be popular with the creative crowd, but now are finding a place on the desks of corporate America. According to the Wall Street Journal, JupiterResearch surveyed technology decision makers at 258 medium and large businesses and projected that 33 percent would be running Macs next year, while only 21 percent were doing so now. "Last year Apple sold 4.7 million Macs, up 35 percent from 2004, and way ahead of the 16 percent growth for the industry as a whole during the same period...."
PR: Apple this week introduced the wireless Mighty Mouse, a new version of its popular multibutton mouse, now with the added freedom that only wireless connectivity can provide. The new wireless Mighty Mouse offers a reliable, secure connection to Macs and features a new laser tracking engine that is 20 times more sensitive than standard optical mice for better tracking on even more surfaces. 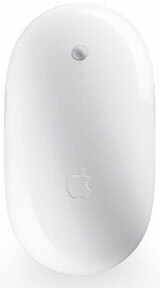 Priced at just $69, Apple's wireless Mighty Mouse includes up to four independently programmable buttons and an ingenious Scroll Ball that lets users scroll in any direction. "We cut the cord on our popular Mighty Mouse to give consumers even more flexibility when using a Mac," said David Moody, Apple's vice president of Worldwide Mac Product Marketing. "A Bluetooth-enabled Mac desktop with an Apple Wireless Keyboard and Mighty Mouse is the ideal cable-free setup at home or in the office, and the wireless Mighty Mouse is the perfect travel companion for the MacBook user on the go." The wireless Mighty Mouse is a Bluetooth 2.0 based multibutton mouse that retains the simplicity of a single-button mouse, and can be used as a single- or multibutton mouse depending on the user's preference. The wireless Mighty Mouse features a single seamless enclosure with programmable touch sensors that act as primary or secondary buttons. With a simple click on the upper right or left side of the mouse, users can instantly access features such as contextual menus found in Mac OS X and other applications. The wireless Mighty Mouse's two other buttons are activated by pressing its Scroll Ball and squeezing its sides, and can be easily programmed to give users one-click access to Mac OS X "Tiger" features such as Spotlight, Dashboard and Exposé, or to launch any application such as Safari or iChat. The wireless Mighty Mouse features an easy-to-use design that comfortably fits the left or right hand. It also includes an advanced power management system that automatically switches to low power modes during inactivity, and an off switch to maintain battery life while not in use. Ready to use out of the box, the wireless Mighty Mouse works with either one or two AA batteries. The wireless Mighty Mouse is available immediately through the Apple Store, at Apple's retail stores, and Apple Authorized Resellers for a suggested retail price of $69. The wireless Mighty Mouse easily connects to the latest Macs with built-in Bluetooth wireless technology, and requires Mac OS X "Tiger" version 10.4.6 or later to customize buttons for one-click access to Spotlight, Dashboard and Exposé or to launch applications. "If the wireless Mighty Mouse will not operate and will not appear in the Bluetooth pane of System Preferences, install the supporting software. The wireless Mighty Mouse will not work until the software has been installed. To install the software...."
"This year has brought a flood of new Mac models, as Apple quickly converts all the computers it sells into ones running processors created by Intel. And just as surely as summer follows spring, the release of new Mac models are followed by reports of various quirks, flaws, annoyances, and other issues with those models. "We've all been told that it's a good idea to have as much information as you can before making a purchase. But thanks to the Internet, the amount of information you can get on any given product is more than you could ever stuff inside your head. So what's a Mac user to do?" PR: Other World Computing (OWC) has announced the immediate availability of the Quad Interface version of its flagship external storage solution line, the Mercury Elite-AL Pro - featuring four interface options in one external hard drive and a starting price of only $199.99 and capacities from 250 up to 750 gigabytes ( GB). This exciting new Quad Interface Mercury Elite-AL Pro features one eSATA, two FireWire 800 (1394B), one FireWire 400 (1394A), and one USB 2.0+1.1 ports and ships with all required cables to allow easy plug-and-play operation with virtually any Mac, PC, or Linux system. Seamless data accessibility from all interfaces ensures continued optimized connection of the Elite Quad as users move the storage solution device between multiple systems or upgrade their computer systems. Engineered with the next generation, high speed Oxford 924 chipset and the fastest drive mechanisms on the market, the Quad Interface Mercury Elite-AL Pro achieves the fastest single-mechanism transfer speeds possible, sustaining up to 80 Megabytes Per Second. The Quad Interface Mercury Elite-AL Pro is manufactured using Seagate Barracuda 7200.10 and 7200.9 SATA-2 drives and is available in capacities from 250 GB to 750 GB, with the 500 GB model included in OWC's Sizzlin' Summer Sale. All OWC Mercury Elite-AL solutions are tested and certified for demanding Audio/Video, Backup, Movies, Graphics, Music, Photography, General Data, and more. The sleek aluminum design optimizes function while aesthetically enhancing the desktop, and is specifically built to safely endure the rigorous demands of portability. All models are EMC Backup Certified and are directly supported by EMC's industry respected standard Retrospect Backup software. Mercury Elite-AL Pro storage solutions come packaged from Other World Computing with everything needed for immediate plug-and-play operation: all necessary cabling; Intech HD SpeedTools utility suite; EMC Retrospect backup software; and a full 2 year Warranty. A five-year warranty on the internal Seagate mechanism covers the internal drive for three full years after the solution's warranty comes to term. PR: Trans International today announced the addition of 160 GB drive to it's miniXpress SATA to FireWire Portable External Storage Solution line. This affordable miniXpress ($328) is the largest capacity external SATA to FireWire drive and utilizes the Hitachi 2.5" SATA drive. 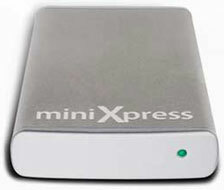 The miniXpress Portable External drive utilizes the latest SATA to FireWire, hot swappable and bus powered technology. This allows the drive to be swapped without restarting the computer and, powered through the FireWire port, it does not need an additional external power supply. The drive mounts automatically when plugged in to the computer. It's rugged yet stylish Aluminum cases assures durability and efficient heat dissipation. Small (can easily fit in your shirt pocket), equipped with an anti-shock mechanism and triple interface (F800/F400/USB) the miniXpress is a versatile, durable and highly portable storage solution. Trans International has also available internal SATA 160 GB drive. This affordable ($229) storage solution is ideal for upgrading MacBooks, MacBooks Pro and Mac minis as well as other computers and devices that use 2.5" SATA hard drives. PR: Never has there been a niftier way to carry music files, photos and other valuable personal electronic data than with the new Jeep USB Flash Drive and the USB Flash Drive Plus Ink Pen from EDGE Tech Corp., a leading supplier of DRAM and Flash memory upgrades, portable computing products, storage devices and other experience-enhancing technology solutions. The rugged flash drive was created for those who savor the off-road lifestyle - where creature comforts are sacrificed for the thrill of back trail adventure. The Jeep USB drive is designed to reflect the ruggedness, durability, and style that consumers have come to expect from Jeep vehicles. The Jeep USB Flash Drive ships in 256 MB and 512 MB of storage and is about the size of your thumb. Priced at $29.95 and $44.95 after rebate, the drive is Plug-and-Play - simply insert the drive in any USB port and files can be saved or transferred. The drive, complete with the Jeep logo, comes in a shock-resistant case. The Jeep USB Flash Drive Plus Ink Pen is a unique, dual-function portable storage device. Users simply unscrew the barrel of the sleek, executive style ink pen, and discover a fully functioning USB Flash Drive inside. The drive portion of the pen plugs directly into a computer's USB port and is recognized as an additional storage device on the user's desktop. As with the previously mentioned drive, the Jeep USB Flash Drive Plus Ink Pen also allows for easy transfer and storage of digital photos, songs, and other important files. The device includes a cushioned grip for extended periods of writing, a USB extension cable for hard-to-reach connections, and an extra replacement ink cartridge. With this device, users will reap the benefits of both form and function. The Jeep USB Flash Drive Plus Ink Pen is priced, after rebate, at $29.95 for 128 MB and $49.95 for 512 MB. PR: SteerMouse allows using extension buttons of any multibutton mouse. You can make the best use of a button which previously did not work on Mac. SteerMouse allows adjusting of the cursor's speed and acceleration. You can adjust the cursor's speed and acceleration. (Apple's driver allows you to adjust only the cursor's acceleration) By adjusting both the speed and acceleration, you can customize the best setting that fits the movement of your own hand. When a window or dialog box is activated, SteerMouse moves the cursor to a specific location on the screen: the default button; the cancel button; the close button; etc. You never lose sight of the cursor's position, because the cursor does animated movement. SteerMouse has a lot of convenient and unique functions, and customizes your mouse greatly. It is possible to allocate shortcut keys based on the rotation of the scroll ball and wheel. Move the cursor to a specific location, such as the default button and the close button, etc. You never lose sight of the cursor's position, because the cursor does animated movement. Scroll vertically or horizontally. You can adjust the scrolling speed and acceleration. You can assign click, double-click or modifier click, etc. Display the process screen for switching applications. SteerMouse is customizable in each application. You can configure your mouse with different groups of settings for different applications. Find the best setting that's right for you. Improved the shortcut key for Exposé and browser back/forward on the scroll ball rollings of Mighty Mouse. It now works appropriately. Problems solved where buttons on some mice did not work. Many other enhancements and improvements were added. System requirements: Mac OS X 10.4.3 or later. PR: Sonic Solutions has broken new high-definition ground with the release of Toast 7 with Blu-ray Disc (BD) support - the first application of its kind for the Mac. The software ushers in a new era of advanced optical disc recording providing Mac users with the ability to store as much as 50 GB of data on a BD-R (recordable) or BD-RE (rewritable) disc. The Blu-ray Disc capabilities extend Toast's long history of Mac-platform firsts and exemplify Sonic's commitment to helping the industry make a successful transition to next-generation formats. Toast 7 with BD support is available exclusively for original equipment manufacturers developing next-generation external BD drives. The first drives to feature Toast 7 with BD support are expected to be available later this quarter. Making the recently impossible now possible for Mac users, Toast's Blu-ray Disc features include Toast Dynamic Writing, which for the first time enables users to record files simply by dragging and dropping files onto a disc in the same convenient way they would move or copy files to a removable storage device. The ability to store as much as 50 GB of data makes Toast an ideal solution for archiving extensive digital music collections or protecting critical files and precious memories too large to fit on a standard DVD. In addition to its Blu-ray capabilities, Toast 7 is now also a universal application that runs natively on both Intel-based and PowerPC-based systems. "We are extremely pleased to continue our pioneering work and provide Mac users with new ways to exploit the full power and potential of the platform," said Stan Wong, general manager, Roxio division of Sonic Solutions. "The inclusion of Blu-ray Disc capabilities adds to an already unrivaled lineup of digital media features that have made Toast a retail leader and the standard for CD and DVD burning on the Mac. Toast 7 with Blu-ray Disc support represents a compelling solution for manufacturers of next-generation BD drives who want to provide their Mac customers with a product that has become synonymous with quality and innovation." Toast 7 with BD support is the latest in a long series of high-definition initiatives by Sonic Solutions, which began its pioneering work on next-generation formats over two years ago. Sonic has taken the leading role in helping the industry make a smooth transition to high-definition, spearheading the High Definition Authoring Alliance (HDAA) in 2005 to prepare Hollywood and their authoring facility partners for the rollout of BD and HD DVD titles. More recently, Sonic announced an extension to the Alliance with the formation of an Advisory Group (HDAA AG), comprised of top-tier computer and consumer electronics companies. The HDAA AG is collaborating with the HDAA to ensure high-definition formats deliver reliable, consistent and dynamic viewing experiences across platforms. Sonic has also released a number of high definition software applications that are in use today in both the professional and consumer markets. Original miniStats have been downloaded more than 150,000 times and some have been in Apple's Top 50 for weeks. Our new miniStat2 doubles the features of previous miniStat widgets. Now you can increase your Mac system monitoring with many new features, its numerous code optimizations, and all in a compact widget with customizable skins. This widget shows all information about your Mac's processor, memory, storage, sensors, network connections and battery. Detailed statistics about CPU, memory, storage, network, temperature sensors and battery. Customizable cool looking skins. Updates every second. Only 1% of CPU when updating. 10M of RAM at average. miniStat (including Traffic Meter) 350 x 250 total for all seven widgets. All this stuff separated into six widgets. Each widget shows only one value. For example, miniFreeRam shows only amount of a free RAM. 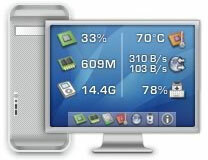 miniStat2 widget shows a detailed view for all four types of RAM usage. 15% of CPU total and 50M of RAM at average for all seven widgets. Customizable skins - make widget look like your Mac! No special configuration required beyond selecting your skin and your temperature units. Just install with a few clicks and it is up and running on your dashboard. Active processes list - The "Processor" section is now modified, so you can check now what are the most active applications currently running. Added the "P" button shortcut to open processes list from anywhere in the widget. Battery remaining time values will be now the same as values reported by the Apple's battery icon. Fixed some issues with interface feedback. Intel-based Mac temperature sensors - thanks to the SpeedIt module from InCrew Software miniStat2 now can use temperature sensors from all new Macs with Intel Core Duo processor. Now you can change currently monitored network interface right from Network tab of the widget. Just click on the network interface name (en1, en0, ...) and selection menu will popup. Storage tab of the widget now will show only physical hard-drives. Mounted disk images such as .dmg or .iso will not popup there anymore. Thanks to Ramon Medrano Llamas, miniStat2 is now fully translated into Spanish language. For more deals on current, recently discontinued, and older notebooks, see our MacBook deals, 15" MacBook Pro deals, 17" MacBook Pro deals, 12" PowerBook G4 deals, 15" aluminum PowerBook G4 deals, 17" PowerBook G4 deals, titanium PowerBook G4 deals, iBook G4 deals, PowerBook G3 deals, and iBook G3 deals.